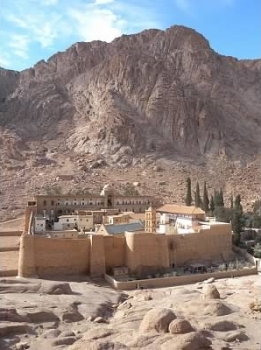 Saint Catherine's Monastery at the mouth of an inaccessible gorge at the foot of Mount Sinai is one of the oldest continuously functioning Christian monasteries. The monastery was built by order of Emperor Justinian I between 527 and 565, enclosing the Chapel of the Burning Bush ordered built by Helena, the mother of Constantine I, at the site where Moses is supposed to have seen the burning bush; the living bush on the grounds is purportedly the original. The site is sacred to three major world religions - Judaism, Christianity, and Islam. I visited this WHS in April 2010. I started to climb Mount Sinai at around 4am to view a spectacular sunrise at around 7am. After the sun rose, I continued to trek towards the Monastery of St. Catherine at the foot of Mt Horeb, where Moses received the Tablets of the Law. The whole area is considered sacred by 3 religions: Christianity, Islam and Judaism. in my past life i used to climb the Mt. Sinai for living! i did that almost 80 - 100 times .. for sunrise and such! Nowadays, and after i realized what is best for me, i got myself i little house in here and i enjoy the magnificent healthy spiritual life in these mountains. If you come around that far and high, its sad that you don't give yourselves the time to meet with yourselves! Spend few days and learn new experiences. It's an increadible experience up the Sinai, but the guides sell you this a first level dificulty climb. This is not true. And the dry weather became freeze ou too much hot very fast. It's impossible climb the mountain and see the Monatery at the same time you go there. The Monastery is too interesting but the visit gets you about 15 or 20 minutes, because the monks don't let you stay looking at. There, you keep the line, see and farewell. The last leg of my Egyptian trip – the Sinai Peninsula and Sharm El Sheik – heading for the Saint Catherine Monastery in the mountains. I’m sure that Sharm El Sheik is a haven for those who just loves resorts, especially in combination with diving but in my - strictly personal opinion – its nothing but a sad place with one concrete hotel next to the other and garbage littered desert. If you want to go here I strongly recommend the small towns of Dahab and Nuweiba further up the east coast of Sinai. At the time of my visit to Saint Catherine’s, the entire tourist population of Sharm El Sheik must have decided to go here. Given the crowds, I still got quite a nice view and understanding of a monastery that with its desolate location has been virtually uninfluenced by the surrounding world over many centuries, preserving a religious ambience that you only find in Jerusalem or in religious centres in Russia. The reason for Saint Catherine’s location, in the midst of the Sinai Mountains, is of course Moses and the mountain where he received the Ten Commandments from God. Besides Moses, they say that the desert and the Sinai Mountains have given birth to many prophets and philosophers thanks to its desolate, beautiful and majestic landscape - once there’s nothing around you, you have to look inside to find truth and meaning to life. Believe me….it works…! Unfortunately St Catherine’s closes for various religious days and, to complicate matters further, is still operating on the Julian, not the Gregorian calendar! I know of no way to check in advance whether it will be open on any particular day or not. So, on my second visit we could not get in (luckily I had already visited the “Burning bush” and the library). There is still Mount Sinai to climb however! It provides some fine views down onto the monastery and a wide panorama at the top. It will take about 3hrs. It is “traditional” to do it at night (when you can make it more of a “pilgrimage”) for the sunrise but if (as we are not) you are not a great lover of sunrises it is a reasonable climb in winter before the sun rises too high. Libraries: "The monastery library preserves the second largest collection of early codices and manuscripts in the world, outnumbered only by the Vatican Library. Its strength lies in Greek, Coptic, Arabic, Armenian, Hebrew, Georgian, and Syriac texts. The Codex Sinaiticus, now in the British Library, left the monastery in the 19th century for Russia, in circumstances that are now disputed." Emperor Justininian: The Walls and Basilica were constructed in 527 A.D on the orders of Justinian to protect and enhance the Chapel of the Burning Bush. 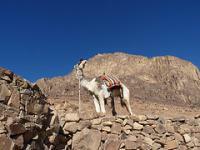 Tourist Treks: Sinai Trail: Egypt’s 1st long distance hiking trail. 104 Community Members have visited.